Made from 80% recycled post consumer plastic bottles. Non-Woven Polypropylene (PP) green accent trim. 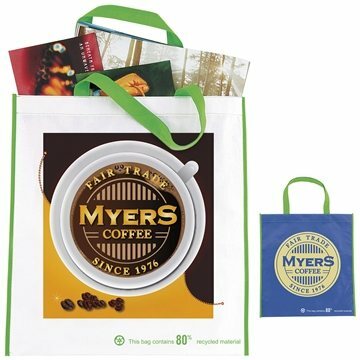 Recycled symbol and material content stated in bottom corner of tote. Good size and sturdy material... the good thing would be that the artwork and proofing are easy, we received our bags very rapidly! It was perfect for what we needed them for. The price was also very reasonable. Excellent printing. We've used this item before and it's a hit with our patients. Plus, the entire process of ordering and posting the logo design artwork was quite simple.